Many people dream of one day designing their own home. For some it seems like a far-away dream, and for some it is the reality of their lives. When my parents set out to make their own home with their own hands 30 years ago, they probably had no idea what they were getting into. And even worse, they were not only building their future home, it would have to stay afloat too; that’s right, they were building a yacht. With my dad taking 6 months off work to complete the boat at the end of a 4-year process and my mom working 2 jobs to support the both of them, you might say they were crazy. Yet, in the present day they are at it again, renovating the largest home they ever lived in to make it their absolute dream home. For a long time, I did not realise how this upbringing would affect the view I had on my profession. I had a similar urge to build, to create, and in the educational system I was in that soon translated into pursuing a career in architecture. Studying at TU Delft, I was taught all the right methods and approaches to analyse a brief and to come up with an interesting concept. I slowly learned how to suppress any doubts or insecurities I had about my designs in order to give a convincing presentation and present myself as the master architect. However, during my master studies I got an itch to look into self-organised housing for a paper. I researched the emergence of bottom-up housing development in the twentieth century and became increasingly convinced of this movement. This caused a major identity crisis for me: I was trained to think for my clients, my future residents, for society. And now they had a will on their own. Looking at graduation topics I could not find meaning in the assignments presented, because they were all directed towards the architect looking at a situation, often even unfamiliar to him or her, analyzing it and coming up with a magic solution. I realised I had to come up with my own assignment. While looking for a mentor to supervise my graduation project, which focussed on self-organised housing in cities and affordability, I came in contact with prof. Darinka Czischke. She was willing to guide me in my process, and put me in contact with amazing professionals and academics around Europe to feed my research. Even though I graduated with an Architecture degree (https://repository.tudelft.nl/islandora/object/uuid%3A76a43029-69e1-4d4f-a569-e343e4144b86), by doing this research in the department of Management of the Built Environment, I had also learned how to look at the built environment from a non-architect point of view. Author Darinka CzischkePosted on October 5, 2018 October 5, 2018 Leave a comment on Towards collaborative mat-hybrid housing. An experience for Co-lab. As a three-year-old girl, I would sit in the improvised swing that my dad set up for me in the living-room-to-be (not a very safe thing to do, now that I think about it), and I would witness the fascinating process of transforming piles of bricks into thick walls and long glass slabs into windows. A part of the house was growing up at the same time that I was growing up. Ever since, I have always considered the built environment as a permanent process; a living organism, constantly adapting to new needs and demands. Many years later, finally as an Architecture student at FAUP, Porto, Portugal (not surprisingly, after this bucolic and heart-warming introduction) I developed a particular interest in the origins of some collective housing models, more specifically on Existenzminimum, and decided to work on that topic in my Master Dissertation. Existenzminimum is one of those (German) concepts that cannot be accurately translated into other languages; the direct translation into English would be ‘minimum subsistence’ or ‘subsistence level’. However, neither of these expressions do justice to the progressive ideology of the concept. When specifically used in the housing domain, the term can be translated as minimum dwelling. This approach mainly aimed at creating a new way of collective living at affordable levels, more suitable to the new post-war societal needs, through a ‘mini-max dwelling concept’, where the minimum amount of space could accommodate the maximum of life. After my Master Defence, on the 9th of December 2011 (symbolically enough, on the exact same day that an international symposium was being held in Berlin on the redefinition of Existenzminimum), my supervisor Prof. Dr. Nuno Grande said to me: “Ok, now you have the basis to start a PhD.” Although his suggestion inspired me, after spending six sleepless years designing and making models, at that point I was itching to start working as an architect, to finally put into practice everything I had learned. So there I was, freshly graduated, full of energy and ready to fly… little did I know that I was about to land in the middle of the economic crisis, which hit Portugal very harshly. No construction = no architecture design. And I had no uncles or cousins in need of a house or a refurbishment in that moment. So, I decided to fly somewhere else. I flew to Berlin, to work at Heim Balp Architekten; and then, two years and a half later, to Mexico City, where I worked at Tatiana Bilbao Estudio. In both places, I was able to expand my knowledge on how different cultures explore the general approaches of housing in the contemporary context. In Berlin, I had the opportunity to develop a specific minimum housing model, which we called Bento Box, following the same principle of ‘minimum of space for maximum of life’. In Mexico – a completely different context – I learned about the practical qualities of incremental housing models, with Tatiana Bilbao’s Vivienda Popular, where a temporary minimum unit is set up (equipped with the basic services) with the possibility to grow over time, depending on the needs and financial possibilities of the household. Professional practices aside, I also learned a lot about minimum and collective living arrangements through my personal daily life experience. During the first part of my stay in Berlin and then my whole stay in Mexico city, I had to share the space with other – often messy – flatmates. In total, five different apartments, five different layouts, five different social dynamics. In Berlin, the undersized and overstuffed kitchen didn’t contribute to a healthy social environment, and the shared bathroom was worth a ‘not recommended for sensitive people’ sign. In one of the places in Mexico, our room was directly connected to the shared living room, so every time someone was throwing a party and I just wanted to sleep after an intense working week, I had to discreetly roll into the common bathroom (next to the room, also facing the living room) with my pyjamas and a toothbrush in my hand, hoping that nobody would see my outfit, and then almost suffocate myself with pillows against my head to sound-proof my sleep. These experiences taught me a great lesson: this kind of collective living arrangements requires a conscious design to guarantee the quality of spaces and to promote more natural social relationships. The ‘typical’ and conventional layouts, tailored for nuclear-family structures, are no longer suitable for the contemporary citizen, who has now different needs and demands. ‘The times they are a changin’! The way people live, work, consume, commute is taking new shapes… but how are people reacting to all this? How is design responding to these changes? What new approaches in housing are being developed to give answers to the societal and economic shifts that are becoming so obvious? I raised these questions in a presentation I gave in November 2016 at the ENHR seminar Comparative Housing Policy: New approaches to affordable housing hosted by the TU Delft, Faculty of Architecture and the Built Environment. One of the participants was Dr Darinka Czischke, who approached me to say that her research on Collaborative Housing touched exactly on the same issues. We immediately saw the potential to work together on this. A year and a half later, I’m working with Darinka as research assistant at Co-Lab Research and started carrying out my PhD on Existenzminimum in collaborative housing at TU Delft, where I intend to understand how the interplay between Existenzminimum design principles and collective design processes contribute to affordability in housing. What can people do to house themselves, at a time when governments and market actors are increasingly failing to provide housing that meet their needs and aspirations? Are there any viable alternatives to conventional ways of ‘producing’ and ‘consuming’ housing? In the face of mayor challenges that are deeply affecting our lives, such as climate change, social exclusion, loneliness and isolation, can the way we plan, design and manage our homes and living environments provide any meaningful responses? I began to ask myself these and other questions five years ago, while writing the conclusions of my PhD in housing management at TU Delft. For years I had been busy learning about the macro structures of housing provision; policies and markets, organisations, funding models, subsidies, regulations… a world of formal institutions and conventions. In my six years as research director of the European Social Housing Observatory, I had gained great knowledge on European housing systems and policies. But I wanted to go deeper; I wanted to better understand the tensions and dilemmas underpinning the provision of housing that meets social goals in an increasingly business-like environment. So I decided to embark on a PhD that looked at the interplay of social, commercial and public aims amongst social housing providers. By the time I started my PhD, in March 2008, the Global Financial and Economic Crisis had begun to unfold. Over the next six years we would witness the unravelling of the assumed capacity of conventional forms of housing provision to fulfil their role across European countries. Defaulted mortgages; repossessions and evictions; the appearance of a ‘new’ class of homeless people, made of educated but dispossessed persons; and the gradual housing exclusion of middle income households, not ‘poor enough’ to qualify for social housing and ‘too poor’ or precariously employed to obtain a mortgage in the market… who was going to save the day? Were housing providers of different shapes and colours across Europe able or willing to provide solutions for these people? What if the solutions didn’t have to come from ‘above’; what if people could do something about their own situation, by themselves? A breakthrough moment came when I had the privilege to meet Raquel Rolnik, the former UN Special Rapporteur on adequate housing, during her visit to the UK in the summer of 2013. Listening to the dire account of local stakeholders gathered to inform her about the state of housing in the country, she asked the question: “But, what are the people doing about it? Aren’t there any social movements addressing the housing crisis?” I could see where Raquel was coming from. Being raised in South America, just like her, I could understand her bewilderment at the seemingly lack of collective agency to confront the shortcomings of formal institutions. Collective agency in housing is nothing new. Collaborative housing has existed for a long time in Europe, in many different guises. The tradition of housing co-operatives dates back to the 19th century, as a collective response from workers to their poor living conditions in the industrial revolution era in England, Germany and elsewhere in Europe. Subsequent waves of collective self-organised housing include the Castors movement in France, which emerged in the aftermath of WW II; the work of architects who practiced and advocated participatory approaches to housing in the 1960s and 1970s, notably John Turner and Walter Segal; the ‘Kollektivhus’ movement in Sweden, driven by feminist and progressive thinkers and doers; ‘Bofællesskab’ in Denmark, a living form aimed at bringing people together in communities, translated as ‘co-housing’ by USA architects McCamant and Durrett; the ‘Baugruppen’ in Germany, and so on. Motivations at the core of all or most of these movements include a longing for community life, togetherness and belonging; gender equality and mutual help; care for others and for the environment. More recently, collaborative housing has embraced a new set of drivers, in tune with social, political, environmental and economic changes. Research shows that affordability, the inclusion of a wider array of social groups, and housing an increasing proportion of elderly people in Europe are amongst the main current motivations behind contemporary forms of collaborative housing. If we believe that the ethos and practices found in collaborative housing do provide meaningful and effective answers to the many challenges outlined above, a relevant question is how these housing forms and their guiding principles and practices, can become embedded in planning and housing provision systems. Yet, while many advocate the scaling up or mainstreaming of collaborative housing, we need to acknowledge that this way of providing housing and living together is not for everyone. Collaborative housing is not meant to replace macro structures of housing provision. However, collaborative housing can help to improve current ways of providing housing by introducing innovation and new ways of looking at the user-producer relationship. Furthermore, collaborative housing can become a viable alternative for larger number of households than it is today, especially in countries where this is still a marginal option. This requires a stronger evidence base that sheds light on the relative merits of these housing forms vis-à-vis mainstream alternatives, and better knowledge on what works and what not. This evidence needs to be reliable, comparable and replicable. Thanks to being awarded the Delft Technology Fellowship, three years ago I embarked on a journey to learn more about contemporary collaborative housing forms. I was amazed at the intense exchange and mutual learning happening amongst practitioners and groups of residents, both within and beyond national confines. Yet, the research community seemed to be lagging behind. The increasing research in this field tended to be scattered across disciplines and linguistic/geographical scholarly traditions, with little or no co-ordinated efforts to develop suitable theories and methodological frameworks. This is why, in November 2015, I launched the working group ‘Collaborative Housing’ at the European Network of Housing Research (ENHR), together with Dr Claire Carriou from the University of Nanterre, Paris. The response has been overwhelming; in the first two years of its existence, the working group has attracted the highest number of abstracts out of the 28 working groups within the ENHR. The group has drawn not only academic researchers, but also a significant number of practitioners, eager to discuss and reflect critically about these experiences. 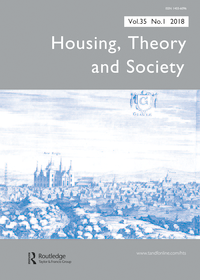 As a result, a variety of further events and collaborations have ensued, including the forthcoming special issue ‘Conceptualising Collaborative Housing’ in the scientific journal Housing, Theory and Society. What have I learned so far in this journey? Collaborative housing, as a collective response to major 21st century challenges, deserves a place amongst the most pressing debates on urban and housing solutions for the future. Co-Lab Research aims to provide a platform to share knowledge and catalyse mutual learning that can add value to these discussions. We hope you enjoy this website and feel inspired to contribute to this broader aim. As a long-standing member and active participant in the network, Darinka will focus on building on its strengths while at the same time breeding innovation and fresh approaches into it.